Good night's work from Wolves whom, after a tight first half, took control in the second period to continue recent run. One loss in 7 now. FULL TIME: Wolves 3-0 MK Dons. Brace from @NicuJr and late strike from @niall_ennis10 books the passage into Round Four. 90+4: Ennis takes a touch, holds off the defender, and fires into the roof of the net. He wanted that goal! 3-0 Wolves. 90+1: And MK Dons very close to a goal. Superb block from Johnson in front of the line to deny Hunt. Visitors still pushing here. 90: Into three minutes of added time here. 2-0 Wolves. 89: Final Wolves change with Delacoe on for Armstrong. 87: Osbourne on for Levingston for Wolves. Levingston had been receiving treatment but is o-k to walk off. 87: Armstrong again cutting inside and fires over. 85: Change for MK Dons with Thomas-Asante making way for Owusu. MK Dons have a corner. 82: Armstrong again running in on goal down the right but his cross is blocked. 80: Neat one-two between Armstrong and Herc. Armstrong's shot then inches wide. Wolves still on hunt for another goal here. 2-0. 78: Fabulous turn from Ennis and then strength to hold off defender before firing powerfully across goal and narrowly wide. 78: Fabulous turn from Ennis and then strength to hold off defender by firing powerfully across goal and narrowly wide. 77: First change for MK Dons with Omar on for Osei-Bonsu. Attendance for tonight's game is 381. Lads appreciate all the support. 70: Change for Wolves and Carnat makes way for Herc. Carnat's goals have put Wolves in control here. 68:Ennis looks like he has beaten the offside trap and excellent finish with outside of right foot. But denied by (very) late flag. 65: Back on the pitch MK Dons not giving this one up. Jackson bursts into box and low shot taken by Bills. May have missed someone but also players Hause/Iorfa/Graham/Ismail also here. May be others! 63: Wolves still searching for more goals. Clever pullback from Enobakhare and Ronan left foot shot is blocked. 61: Thomas-Asante tries his luck to grab MK Dons a lifeline. Good chip from fully 40 yards which Bills turns over the bar. Wolves had finished the first half strongly and carried that in to the opening of the second with quickfire double salvo. An hour gone. 2-0. 51: Wolves extend their lead and it's @NicuJr again. Ennis cross, Enobakhare pullback and Carnat converts. 46: Within a minute of the restart Wolves have the breakthrough. @NicuJr comes in at the far post to head home. HALF TIME: A fairly even contest in which Wolves perhaps shaded the final stages of the half. Goalless and all still to play for. 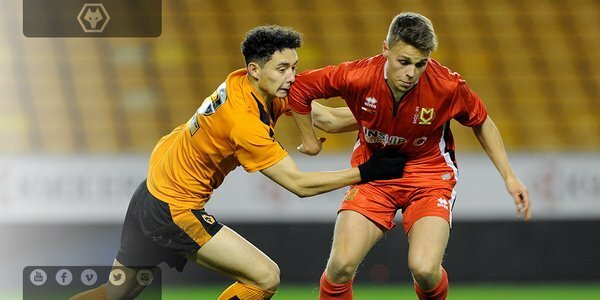 44: And yet after Wolves' recent dominance great chance for MK Dons as Nombe comes in down inside left channel. Shoots over. 43: Corner comes in to the back post. Johnson heads down and McCorkell spills it temporarily before grasping the ball. 43: It's another blistering run from Enobakhare. Past his defender for fun, in on goal. Shot from angle is parried wide by keeper. 41: Wolves starting to control things more here. Armstrong again comes inside onto his left foot. Shot deflected wide. 37: Enobakhare runs from distance and past two defenders but his shot is blocked by Jackson. Good run. Still 0-0 here. 34: Quickly taken free kick for MK Dons and Brittain has a go from distance. Pushed behind by Bills. 27: A few robust challenges have been going in and the first booking of the game goes to Furlong following the latest of them. 26: Armstrong lets fly with a terrific free kick. McCorkell parries. Ball then almost ricochets off Enobakhare and is agonisingly just wide. 24: Closest Wolves have come. Enobakhare finds Ronan who lets fly from some distance. Super strike. Clips top of crossbar. 19: Armstrong appears to be clipped as he runs across to try and meet a through ball. Outside the box. Ref on the spot and waves it away.